In this extended, two-part Jewish Press story, I tell the remarkable journey of Omahan Shirley Goldstein in the Free Soviet Jewry movement and how this historic campaign changed her life and is remembered today. In Part One: The Education of Shirley Goldstein, the story of how this “typical” housewife became politicized and educated in the movement is explored. In, Part II: Activist, Humanitarian, Philanthropist, discover the lengths Goldstein went to in her human rights activist work and the generosity displayed, then and now, by her and her husband, Leonard “Buddy” Goldstein. They were housewives and students and teachers…They called America and many other Western nations home. Galvanized by the plight of Soviet Jews, this army of everyday citizens, together with activists inside the former Soviet Union, formed a grassroots human rights movement that began modestly enough but grew in force. Activists within the movement wanted nothing less than to make the USSR stop its systematic persecution of oppressed minorities. What made the task so daunting is that the target of this action was an authoritarian super power engaged in an ideological Cold War with the West. Nothing suggested this intractable juggernaut would ever bend. But bend it did. Some say the freedom movement even contributed to the Soviet state’s eventual collapse. It’s one of the great triumphs over tyranny in human history. And Omaha’s own Shirley Goldstein played a part in this epoch. But she could only do it after she transformed herself from causalobserver to in-the-trenches activist. In a remarkable journey, she went from zero political involvement to fervent militant. Once caught up in themovement, she devoted much of her time to it, as she has to other causes since then. The experience changed her life. “It opened up a whole new world,” Goldstein said. Her diverse work on behalf of Soviet Jews found her, variously: meeting refuseniks and dissidents in Russian apartments or hotel suites; lobbying U.S. government leaders back home to voice criticism of Soviet human rights violations; discussing conditions and strategies with world statesmen and fellow activists at conferences in Washington, D.C. and overseas; and picketing on the streets, almost anywhere, the latest Soviet transgressions. She saw and did so many things in the course of her involvement that her story provides a useful insider’s look at how the movement evolved and operated. Like many who got involved in the fight, she found in it a higher purpose. As she put it recently, “What does one do with their life?” Serving others became a calling. “And I’ve loved every minute of it,” she said. Her politicalization and activism mirrored that of others who came to the cause. “Shirley was typical of the middle class women who normally would not take any part in politics as such. They were really concerned to do something to help the Soviet Jews. They felt it very deeply. I have a great deal of admiration for Shirley Goldstein. She was a leading light for giving morale and financial assistance to refuseniks and for helping them get out, and she did a great deal for those who managed to get out to resettle in Nebraska,” said Michael Sherbourne, a London-based activist who fed Goldstein information from his contacts in the Soviet Union. Life behind the Iron Curtain was harsh for the mainstream populace, but even more intolerable for racial, ethnic and religious minorities. Long the target of anti-Semitic pogroms and policies, Soviet Jews were routinely denied such basic rights as the practice of their faith, employment in certain jobs, free travel within the country and emigration outside the USSR. An internal passport all Soviets carried was used to target Jews, whose documents, and whose documents alone, denoted their religion. Jews and sympathizers protesting such discriminatory practices could be arrested, interrogated, harassed or imprisoned. By the mid-1960s the pleas of a few Jewish dissidents were heard — enough to coalesce the Free Soviet Jewry Movement. But much of the world remained unaware of or apathetic to just how bad things were and just how many Jews wanted out. Compared to the trickle allowed to leave each year, millions more wished to go but were refused. Once a visa was denied, the applicant was branded and blacklisted. Refuseniks automatically lost their jobs and what few privileges they enjoyed. Even more than before, they became outcasts in their own society. From the mid-’60s through the early ‘90s, the movement — both within the Soviet Union and outside it — forged ahead despite political setbacks. Free Soviet Jewry committees organized. Under Goldstein’s leadership, Omaha had a particularly active one. Agitators like her from the West, both Jews and non-Jews, made pilgrimages to the Soviet Union to meet with refuseniks and dissidents and activists. She and other Western visitors smuggled in banned materials, such as Judaica, along with items like Levi jeans and Marlboro cigarettes, which brought much on the black market. They also made audio recordings of individuals, whose messages — testifying to the tough conditions and rallying support for freedom — were snuck out and then disseminated to Western media outlets. Defying initial opposition from the Jewish establishment and the Israeli government and flying in the face of official U.S.-Soviet diplomatic channels, the campaign eventually gained widespread support. The pressure applied by the campaign and by detente succeeded in doing exactly what it set out to. Faced with sanctions and growing world condemnations, the stubborn Soviets finally ended reprisals and eased restrictions. The sweeping changes ushered in by Mikhail Gorbachev under Glasnost and the eventual dissolvement of the Soviet state, opened the borders for a flood of people to legally emigrate. In the end, 1.5 million Jews left, most for the U.S. and Israel. Some 200 families resettled in Omaha. Shirley Goldstein (formerly Gershun) seemed an unlikely candidate to make history. The Council Bluffs, Iowa native did part of her growing up in Schuyler, Neb., where her family moved, before returning to the Bluffs to complete her schooling. Upon graduation from Abraham Lincoln High School she did what any good Jewish girl did then — she worked (at the Martin bomber plant), got married, bore kids (four) and stayed home raising them. Her husband, Leonard “Buddy” Goldstein, had his own transportation business. Not content with merely educating herself on the subject, she went to the USSR seven times, meeting with leaders and rank and file Jews alike. She took chances, brazenly ignoring U.S. State Department warnings and Soviet orders to steer clear of “troublemakers.” Indeed, she became a familiar figure to refuseniks in Moscow, Leningrad, Kiev, Odessa and other cities. A benevolent angel from the West bearing contraband gifts. A tiny rebel with the brass of a cat burglar. She recorded testimonies and snapped pictures, concealing cassette tapes and film cartridges under her clothes. She sneaked things in and out with a kind of mischievous glee. A true believer unafraid to upset the Politburo or defy the KGB, who knew of her and tried discouraging her, she carried on anyway. She was on a mission. “The world had to know what was happening. It was a priority. I would have rather done this than anything else,” she said. As her involvement deepened, she made more contacts and increased the scope of her activities. She organized Omaha’s Free Soviet Jewry Committee and served on the board of the national Union of Councils for Soviet Jews. She led demonstrations (including ones outside the Orpheum Theatre and Joslyn Art Museum, using the appearances of Russian performing artists as the pretext or stage to protest Soviet policies), she walked in marches and she participated in vigils. She called on members of Congress. She attended meetings in Washington, D.C. and in Madrid, Spain (for the Helsinki Accords). She raised awareness and funds. When not educating elected leaders herself, she recruited new blood, such as the late Ally Milder, to do so. In her role as an aide to U.S. Sen. Charles Grassley (D-Iowa), Milder brought him on board with the movement. Goldstein also spearheaded letter writing campaigns that sent morale-boosting notes to refuseniks and that made appeals for support to public officials. She organized relief drives that collected goods and shipped them to families in the USSR. 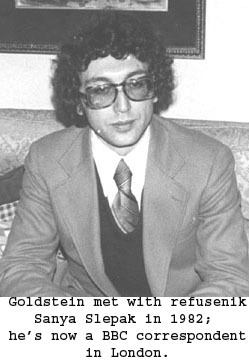 Goldstein never strayed from the fight. When Soviet Jews began coming, she picked up the mantle again and immersed herself in all facets of the resettlement program. Through it all, Buddy Goldstein, was by her side, just as he remains today. He didn’t always accompany her on her far-flung travels, but he supported her and underwrote her activism, sharing her concerns and encouraging her efforts, even when some friends questioned if she was going too far. In a recent interview at their home, the couple recounted her remarkable journey from uniformed innocent to well-traveled activist. 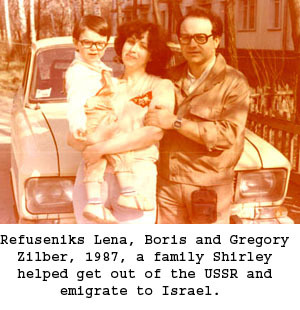 It all started when the two returned from a 1972 trip to the USSR frustrated by the limited access they’d had to the Jewish proletariat and their daily lives. “I’d been doing a lot of reading. I was interested. But I wasn’t able to see anybody — I didn’t know how to do it. Being tourists, it was all surface. It was definitely controlled. We only saw what the government wanted us to see,” she said. She itched for a way to bypass approved itineraries in order to connect, on a human level, with Jews and learn first-hand their struggles. Enter Glenn Richter. A veteran of the civil rights movement and a founder of the Student Struggle for Soviet Jews, Richter is a brother-in-law of Goldstein’s. He’s married to her cousin Lenore. The couple live in New York. 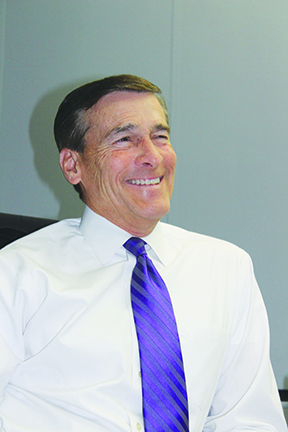 Richter recalled Goldstein being an avid student. “We were dealing at that time with what was largely a hardly-understood situation, with few appeals coming out from the USSR, relying basically on facts known to us at that point, rather than the personal contacts which we all developed. Shirley was quite interested. She’s a good listener — and a good questioner,” he said. He added she and Buddy were well-positioned to serve the cause. “Most people watch history go by. Shirley and her colleagues simply decided, each on her/his own, that they were going to shape history. The core group of activists, like Shirley, seemed to utilize every waking hour to create new ways of advocating on behalf of our friends trapped in the USSR and to keep their spirits up,” he said. By the time she made that ‘73 UNO trip to the USSR, accompanied by her daughter Gail Raznick, she was well-read on the Soviet Jewry issue. She’d been briefed by Glenn Richter and other Union of Councils members and been given contact names. But her real education began abroad, meeting Russian Jews whose lives were filled with hardships in the totalitarian and anti-Semitic regime. She met them in their homes or in her hotel suites. She visited their synagogues and schools. Despite little hope for change, Soviet Jews yearned and struggled for freedom. That’s when it all hit home. That’s when the cause got in her blood. Until then, the problems faced by Soviet Jews were still abstract and far removed. She was also dismayed by the travel strictures and identity tags foisted on Jews. Refuseniks she met expressed their despair. Sensing she was someone they could trust to get the truth out, they confided in her. The fact-finding and reporting she and others did there helped the movement gain momentum. Through networking and communication, the Free Soviet Jewry issue was kept alive. Getting information out meant taking risks. Just how far Goldstein was prepared to go would be tested on that ‘73 trip and on later trips. Refuseniks Aba and Ida Taratuta, whom she met in Leningrad, witnessed her resolve. She’d been given their names by Glenn Richter. They were soon impressed by her sincerity and tenacity. “Shirley brought many items — books, records, tape recorders — that helped us in studying Hebrew or in supporting Zionist activities. The same with cameras, watches and jeans, which we sold. And every time she would bring something personally for us, for our family,” Aba Taratuta said. But the little Jewish woman from Omaha came with an agenda far beyond trinkets. The couple were classic refuseniks-turned-activists. Their situation symbolized the problem, Goldstein said. Below, in Part II of Shirley Goldstein: Cream of the Crop, One Woman’s Remarkable Journey in the Free Soviet Jewry Movement, you will read about how just far this Activist, Humanitarian, Philanthropist has gone for the cause of human rights. 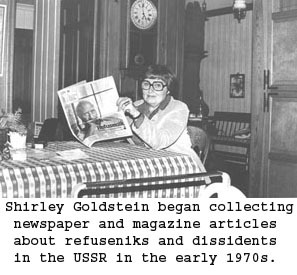 Once swept up in the Free Soviet Jewry movement, Shirley Goldstein set about indoctrinating herself in the tactics of an underground activist. She read, she discussed, she kavetched. 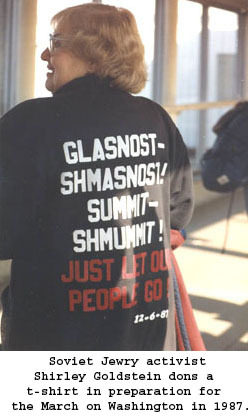 She formed Omaha’s Free Soviet Jewry Committee and joined the Union of Council for Soviet Jews. She became a part of an international network whose advocacy and activism sought relief and release for Soviet Jews denied basic human rights. She learned who to contact among refusenkiks, activists and dissidents in the former Soviet Union. She learned where and when it was safe to meet them. In short, she became a secret operative there, much the way a spy is, sneaking information and materials in and out of that oppressive regime. Back home, she made calls, wrote letters, collected and shipped goods, appealed to politicians, etc., all in an attempt to ease the burden and secure the freedom of Soviet Jews. For the few refugees who made it out at first and then for the flood that followed, she helped their resettlement here. But nothing she did compares to the missions she conducted in the USSR under the guise of “tourist.” This little Jewish lady carried on her work there despite becoming a person of interest to the KGB. When they tried scaring her off, she simply snubbed her nose at the mighty Soviet state. On a 1973 trip there, Shirley and her daughter Gail Raznick went as part of a UNO-sponsored tour. As Part I explored, Leningrad residents Aba and Ida Taratuta were among the first refuseniks she met. The Taratutas opened their lives and their hearts to her, using their apartment as a meeting place for fellow refuseniks to come and share their stories with Shirley, who faithfully documented it all via tape recorder. These meetings built her circle of contacts and added to the testimonies she collected. Another key early contact she made, Edward Sorokin, was not a refusenik at all, but sympathetic to Soviet Jews’ plight and to her humanitarian mission. Shirley and Gail met Sorokin by accident in Leningrad. For Goldstein, such contacts were invaluable as she didn’t speak Russian and didn’t yet know her way around. Once back home, Goldstein acceded to a request by Levich. She prepared and shipped care packages, filled with dried foods, for his imprisoned son. 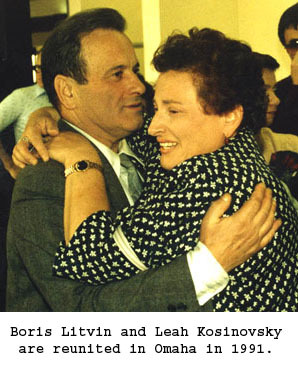 She also returned to the states with lists of names of other Soviet Jews in need of various things. She enlisted the help of Russian emigres in Omaha to box the goods “We shipped out a lot of supplies,” she said. The Goldsteins’ home became a storehouse for hot ticket items, especially, jeans, large quantities of which she got donated from suppliers she appealed to. Her return home from that ‘73 UNO tour of the USSR was nearly delayed, however, when she was detained at customs in Leningrad. Authorities objected to some posters she carried. It was one of many attempts made to hassle her and discourage her actions. They soon discovered she couldn’t be intimidated. “I had visited a Jewish day school, whose children made drawings for me to bring back to children here in Omaha. As I went through customs, I carried the posters under my arm when the agents said, ‘Hand it over — you’re taking out important artwork.’ And I said, ‘No, it’s children’s artwork.’ And they said, ‘No, you can’t take them out.’ I argued, ‘But it isn’t anything…’ They wanted my purse, and I said, ‘No,’ and I just held onto those things under my arm. I was angry with them. “She was defiant,” her daughter Gail said. To avoid hassles, she carried official credentials and letters of recommendation. Gail said she and her mother often got crank phone calls in the middle of the night. That didn’t stop Shirley from slipping out of hotels after midnight to meet people. “It was very spy-like. It was like you knew you were being watched but you couldn’t see anybody. I’m amazed by how courageous she was,” Gail said. “She’s a gutsy lady,” Buddy said of his wife. In Odessa, another attempt to scare off Goldstein at first angered her and then only emboldened her, but not before she had a good laugh at her own expense. “I was asleep in my hotel room when I woke up to find a strange man standing inside the door, looking at me. He didn’t say a word. He just wanted me to know somebody was there. Harassing me. I told him to get the hell out. He did. After that, every time I went out of the room I walked backwards and sprinkled baby powder on the floor so I’d know if anybody came in. And, you know what? I was the first person to walk in and mark my own tracks,” she said, laughing at the memory. Her chutzpah could be inspiring, Laura Bialis, the director of a new documentary film about the movement, Let My People Go, said: “David Selikowitz tells a great story about that. In the ‘70s he was a young American living in Paris who’d come to Moscow to drop off some stuff for refuseniks. He and a friend got to the apartment building, but he was scared by all the KGB cars lining the street. He said, ‘I can’t do this.’ The friend said, ‘Well, we’ve come this far, let’s try it.’ So, they go inside and find the apartment, and there is Shirley Goldstein with Ally Milder…schlepping in all these contraband items. 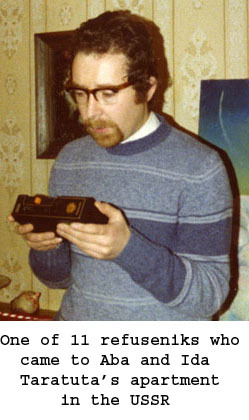 Goldstein’s most historic trip to the Soviet Union came in 1975. It was an Omaha World-Herald sponsored tour that, as usual, she used as cover for her activist work or, as she called it, “doing my own thing.” The tour’s hosts were Herald reporter Wally Provost and his wife Irene. Shirley informed Wally what she planned doing and he agreed to tag along with her to a meeting of refuseniks. Another journalist she brought to the movement is former Jewish Press editor Morris Maline, who traveled with her to the USSR. Under his watch, the Press closely covered the Soviet Jewry struggle and local efforts to address it. She even filed occasional reports for the Press from some of her travels. Also in her own role as a reporter for the movement, she took still pictures of an incident outside a synagogue in which a gathering of Jews were rousted by police. “It opened your eyes as to how they took care of affairs they didn’t want shown to the general public,” she said. Her pics were published around the world. On that same ‘75 trip she was interviewing refuseniks one morning outside a Moscow synagogue closely watched by the KGB when someone asked her, Have you met Sharansky? 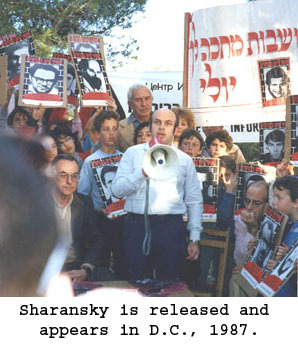 Sharansky’s words, widely circulated thanks to Goldstein secreting out the tape, were a kind state-of-the-union address and call to action for the movement’s followers. Despite painting a bleak picture of the fate of Soviet Jews who dared assert their rights, his message was somehow optimistic and appealed to the international community to apply pressure on the USSR to do the right thing. Goldstein’s proud to have helped made his voice heard. By her third trip, she was an expert at bringing banned articles in and out. She knew which American items brought the most on the blackmarket. While she knew a pair of jeans could be sold for enough rubles or bartered for enough food to last a family weeks, she didn’t realize just how vital that exchange was for survival. The chance to impact a person’s life this way is why she continued to help. Her last visit to the USSR came in 1989. She planned going once more, but by then she’d become such “a nuisance” to the Soviets they revoked her visa. Undaunted, she tried going in with a group of Catholic nuns before being rebuffed. But by then the process she’d been part of to influence Soviet human rights reforms had merged with sweeping changes inside the USSR. “It was public pressure,” she said. “The Soviets hated a bad image and they had one.” She said when the U.S. and its allies tied future trade deals with the Soviets to their making human rights concessions, the USSR capitulated. For a time. Then tensions mounted and the borders re-closed. Pressure was applied again as Western leaders decried the USSR’s hard line. In the era of Glasnost, the Soviets finally relented. In the face of government and media denouncements, much of it fed by the movement, the borders reopened and Jews streamed out to stake their freedom. Shirley Goldstein helped make it possible. She’s considered a hero in the struggle.So say her fellow activists in the movement and so say refugees whose freedom they feel is, at least in part, due to her work. “I love Shirley. I’m proud of her and I’m proud I’m among one of her friends. She’s an absolutely exceptional person. She did very much, not only for our family, but for every family wanting to come here. 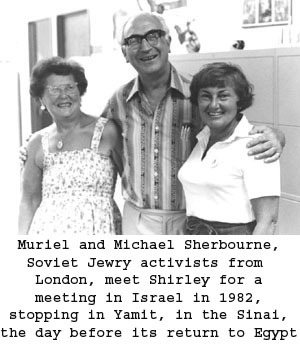 Shirley met with refuseniks and activists like us, people who believed in the right to be free. That’s why we fought for this. And finally, with her help, we won,” said Lydia Linde, who emigrated in 1990 with her husband Eugene thanks to the Goldsteins sponsoring them. “If you think of the things she was able to do, she definitely could be considered a hero, because she was risking her well-being doing these things and getting the attention of people around the world to what was going on in Russia. Her work definitely helped people in Russia who wanted to be free. It rose a tremendous amount of awareness of how to help, how to fight, how to push governments to change their views,” said Anna Yuz-Mosenkis, who came to the U.S. with her husband Igor and their two children in 1991. The story of the movement’s success endures in the lives and in the accounts of people like Richter, Goldstein, Linde and Yuz-Mosenkis. With each passing year, however, the number of surviving activists and refuseniks declines. Thus, there’s an urgency to recording this story for posterity. That’s what drives the makers of Let My People Go, the new film that tells the story of the movement through the experience of Goldstein and others. It’s also what drives the organizers of an archive, Remember and Save, dedicated to preserving the history of the movement with materials from activists like Goldstein. Waging the campaign for the release of Soviet Jews was one thing. Helping sponsor refugees once they came here to start a new life was quite another. 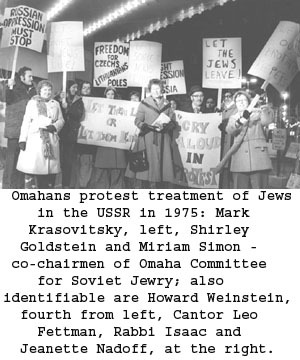 Yet Goldstein aided Miriam Simon in leading the Omaha resettlement effort. The two women secured the support of the Jewish Federation. Jewish Family Service pitched in. Private donations from individuals and businesses like Nebraska Furniture Mart and Borsheims helped. The first families came here in 1975. Simon said refuseniks hold Goldstein in high regard because she not only worked to free them but was always there for them after they arrived. She’s been called “an angel” to Omaha’s Soviet Jews. “Whatever happened to anybody here, Shirley came to help,” said Lydia Linde. “She was very good and friendly and helped us a lot,” said Anna Yuz-Mosenkis. Well known for doing special things, Shirley’s donated money for the Kripke Library’s Russian-language section that Linde heads and she ensured pianist Yuz-Mosenkis got a piano of her own after she and her family came. 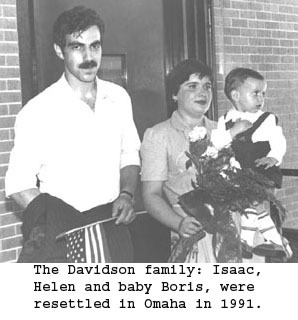 As more refugees began leaving the USSR, the resettlement effort needed more funding and the Operation Exodus drive led by Tom Fellman and Jay Lerner raised more than a million dollars. 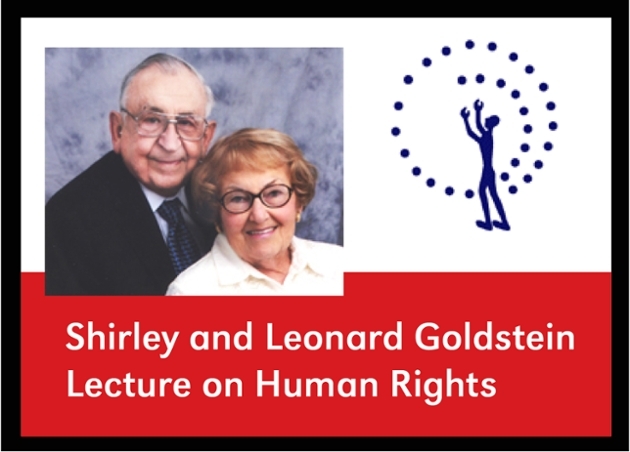 In 1999 the couple endowed the Shirley and Leonard Goldstein Lecture on Human Rights series at UNO, which annually features presentations on emerging human rights issues. They provided seed money for the documentary Let My People Go. They’ve supported Israeli resettlement efforts. They support the Jewish Historical Society, the Kripke Library and countless other things. Their contributions have been recognized. 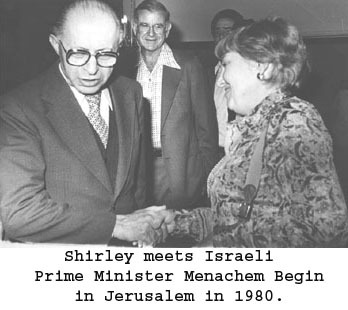 In the 1980s Shirley won the Jewish Federation’s Humanitarian of the Year Award. In 1996 she received an honorary doctor of humane letters from UNO “for her timeless efforts on behalf of Soviet Jewry and the cause of human rights worldwide, for her conviction and example that one person can make a difference in the lives of others, and for her ability to inspire compassion and humanity, both near and far.” She’s also been honored by the Union of Councils for Soviet Jewry and the National Conference of Christians and Jews. In 2005 the couple received the My Brother’s Keeper Award from Chabad of Nebraska. Her work for the movement and for other causes has been all about the journey. Like any giver, her life’s been enriched for her generosity. She reminds us anyone can make a difference. It starts with taking an interest and then acting on it.